The unique and more important feature is 100% customizable lexer, so you can adjust it for any type of text file without programming. Syntax highlighting, text folding, text structure view, etc. are defined by rules on resource level. To adjust editor for new text format there is no need to programm, you need only define a set of rules in lexer editor. To design lexers use Syntax Editor application. Library contains 32 components to build professional applications. powerful form designer which is based on the same concepts as Delphi's form designer. Using EControl Form Designer Pro you may easily create and integrate design environment in your applications. 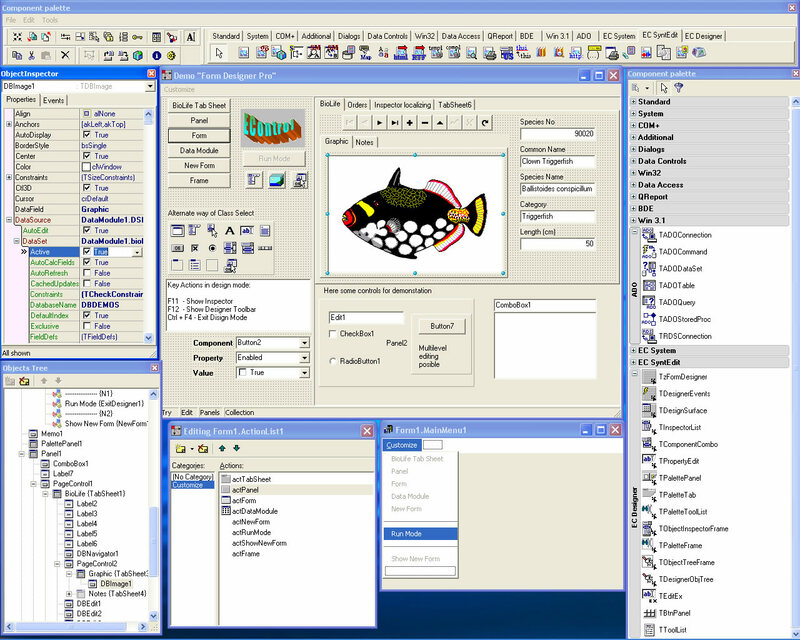 It uses all registered property editors, component editors and other design objects. You may use all abilities of existed design objects which are essential part of any VCL library. Designer, Design surface, Component combo box, Object inspector, Component palette, Tools Palette, Object Tree View, Design time dialogs (Align, Align Palette, Size, Scale, Tab order, Creation order, etc. ); component palette, packages managing dialogs. You can edit Forms, Data Modules, Frames, Report, separate controls on Form. Easy integration with any 3d-party script engine. is fully functional plain text editor with syntax highlighting and text structure view. It is compiled using EControl Syntax Editor SDK and demonstrates main features of the library. Editor allows working with text in different formats and codings. Editor represents text in hierarchical view that make navigation and analysis easier.Text is analyzed by the fully customizable syntactical analyzer (lexer). User may edit existed or create new lexers. Use this application to design and test new lexers. Text structure view and some original tools like multi-replacements makes editor useful in daily routine. 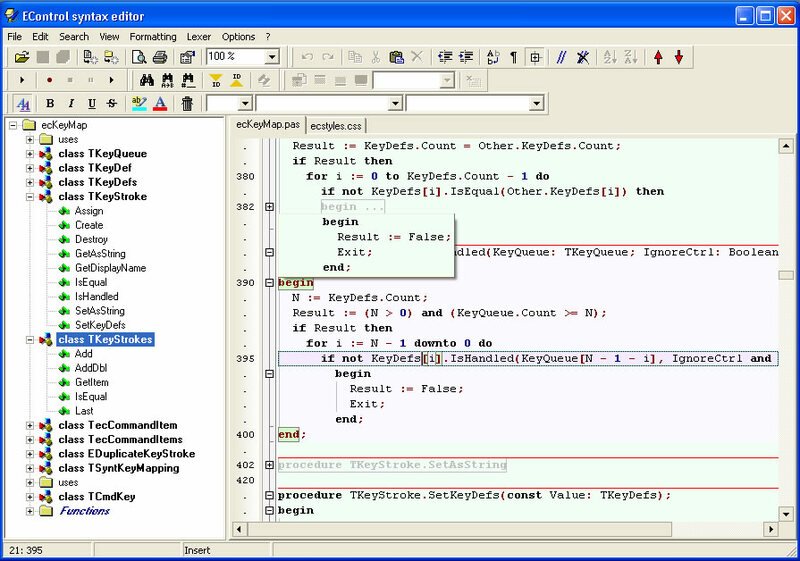 EControl Syntax Editor application is freeware and can be freely distributed. the multipurpose program based on geoinformation system, providing imitating modelling radio-electronic conditions (REC) in the specified range of frequencies and areas of space, forecasting of influence of the REC on radio engineering systems. Use this software for automatization of radio communication systems and networks designing. The basis of Radio Planning GIS: mathematical models of radiowaves propagation, receivers, transmitter, antennas and feeders. Radio Planning GIS provides a wide range of tools which provides abilities to solve complex tasks point-to-point and zonal analysis, electromagnetic compatibility and frequency planning, processing of thousands of objects (transceivers/receivers) at a time.